The modeller is well served by commercially available kits and components. The range of these is constanty changing. The lists are offered as a best effort, but the Society cannot vouch for or guarantee their accuracy. In addition, the Society has commissioned kits and components to complement commercial products. These are available at the prices shown below, from Ian Ford, 20 Windsor Road, Levenshulme, Manchester, M19 2EB. All cheques should be made payable to "Highland Railway Society". Postage shown below applies to UK only. Overseas orders will be charged at cost. Members receive a discount on these prices. The Society's extensive collection of drawings is available to help modellers. Click here for the full list. 8T Jones Van : One piece resin moulded body. A roof, wheels, buffers, "W" irons, axleboxes, brake gear, springs, couplings, paint and transfers are needed to complete your model - many of which are available from the Society (see below). Available to members at £10.00 each and non-members at £14.00. Post and packing £3.00 for up to five vans. Castings for wagons: Jones Axleboxes, Jones Buffers, Drummond Axleboxes, Drummond Buffers, white metal castings. Packs of 12 of any one component cost £1.20 (members) or £1.75 (non-members) per pack plus p&p £1.00 per 1 - 5 packs. Locomotive Tablet Catchers: lost brass wax castings. Sprue of 2 castings at £4.50 (members) or £5.00 (non-members) inc p&p. Early Locomotive Buffers: Lost wax castings of the "stepped shank" type buffers typically used on early locomotives (please note, these are solid castings not sprung buffers). Set of 4 buffers; £4.00 (members), £4.50 (non-members) inc. p&p. 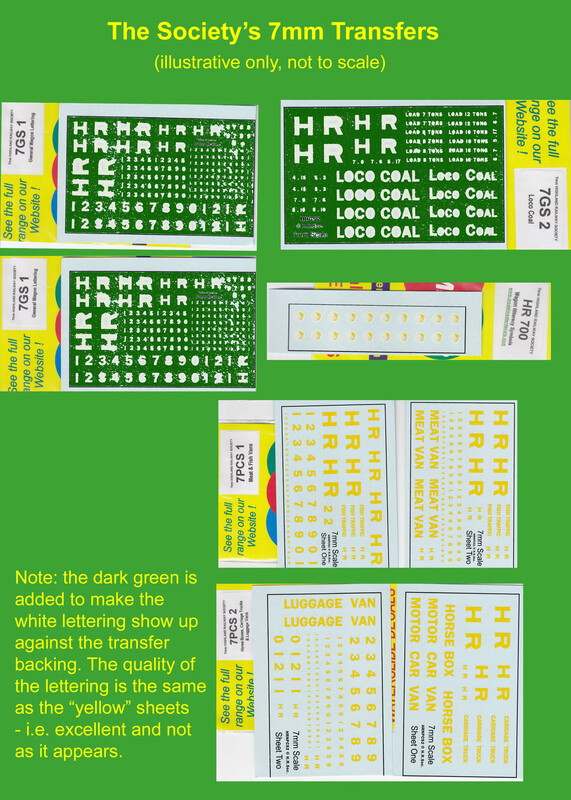 Locomotive Number Plates: We have a limited range of etched brass locomotive number plates for sale to members only priced £1.00 plus an appropriate stamped, self-addressed envelope. Please e-mail for a list of which numbers are available. Brakegear: brass etch for either the HR or LMS single shoe brake gear for 1 wagon. £1 (members) or £1.50 (non-members) per etch plus p&p £1.00 for 1 - 5 etches. Private Owner wagon Transfers. Rub-down transfers painted in white, with full instructions on how to apply and to add shading where necessary. Two sheets are available. Each costs £8.00 (members) or £9.00 (non-members), inc p&p. Sheet 15 – Luncarty Bleachfield (2 types); D Petrie, Inverness (2 types); Nairn Gaslight Co.
Jones axleboxes, white metal castings. Not available. Jones buffer bodies, white metal castings. Not available. Jones wagon springs, white metal castings. Not available. Axle Guards (“W” Irons), etched brass in two patterns, type 1 for 3’ or 3’6” wheels and type 2 for 3’ 7” wheels. £6.50 per pair (members), £7.50 per pair (non-members) plus £1.00 post and packing for up to 4 pairs. 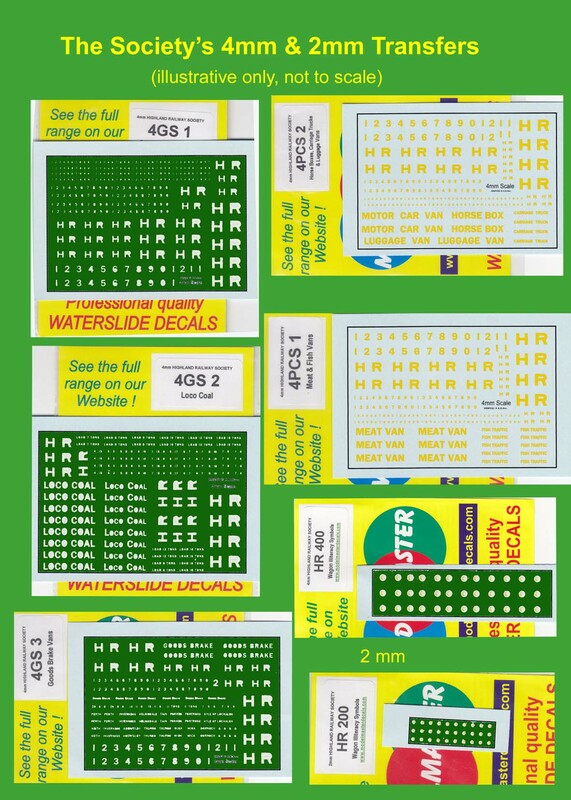 These waterslide transfers for Non-Passenger Coaching Stock (yellow) and Goods Stock (white) have been produced for the Society by MODELMASTER. To see what is on offer, click on either 2mm and 4mm or 7mm. (Note that transfers are better quality than the images shown.) Please add £1 post & packing per order.